How are soldiers taught to kill? Swiftly and silently standing up from behind, cutting the throats ! I think you may find that soldiers of the period did not carry a knife. They were issued with a penknife, and a bayonet. The triangular 'spike' bayonet was the common style right up until the late 1880's, when a blade-style bayonet came into use. 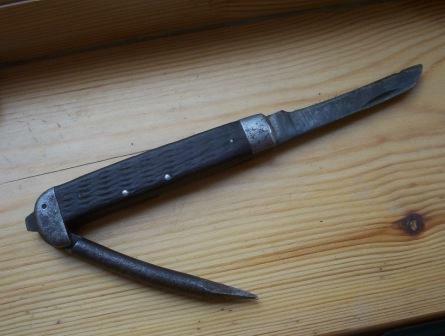 This blade-style bayonet might have been too long to be used 'commando' style, as you seem to describe. Of course, he may have simply used a kitchen knife. "The most commonly assumed method is that the victim was subdued in some way, either choked or strangled. She is laid down and her head held firm with his left hand, while he used the knife across her throat in his right hand. Nichols has the pressure marks on her jaw which are consistent with this approach." Dr. William G. Eckert,forensic pathologist in "The Secret Identity of Jack the Ripper" disagree(d). Ever heard about the "second opinion"? Doctors disagree with each other, so do lawyers. It isn't just "what they think", that matters, its just as much "why they think" what they do that matters. Does he explain the "why"? I have been taught that cutting the throat is more convenient with the victim standing,and also that if not done correctly, can result in a measure of resistence.Whereas stabbing is a more likely and efficient way if the victim is lying down. When the victim is prone it is far easier to cut deeper than intended, which might explain why some victims had deeper and more severe neck lacerations than others. In which sense to do you mean "prone", Michael? Face down or face up? Some people use prone to mean "lying down" in general, whereas it actually means lying face-down ("supine" is lying on the back). Not saying you mean it that way, but just checking for clarity. W hat if she was in the crawl position when the throat was cut? Who killed Tabram? I do not know.The Ripper was never named,but she was a victim.